New tights and new shoes! It has been a busy week in our household – but a good one, especially when both Max and Lucia had throat infections last week. Happily, both are on the mend now with Max back to school and bringing home plenty of catch up homework! As for Lucia – it has been a week for tights and shoes! On Tuesday her long awaited new compression garments arrived and fitted well so we were delighted – as was she in her ‘new tights’. Then today we decided to take a trip to the local shoe shop to see if any shoes may fit her. We do this every few months on the chance that there may be a new style that would work. However, my main motivation was to try and get her a leather pair for winter as her poor feet have been freezing lately in her canvas Converse. We had the most helpful sales assistant who spent an hour with us trying to find something to fit…and about 20 pairs later (no exaggeration) we got a pair! Pink, soft leather and oh so pretty. Lucia absolutely loves them and is proud as punch! I think I will probably take her to see Lymphoedema Physio Lynne to make sure she is happy with the fit but i think they are practically perfect in every way. We then went to pick Max up from school and Lucia was running around outside as we waited…and she fell hard on her knees. Thankfully she was ok – just a small scratch on her knee that we’ll keep a close eye on – but her tights didn’t escape so well and the left knee had a gaping hole. Just three days old and ruined. I actually cried as we have no back up pair yet. This was our first pair made to her new measurements, so until we tell the company we are happy with the first pair they hold off on any further pairs. I contacted Lynne to tell her and she quickly got onto Jobskin so hopefully we’ll get the next pair within the next week to 10 days. Until then, I got my sewing kit out (again) and repaired as best I could then washed them to try and get the muddy stain out too. So bit of a mixed day, but mostly good. 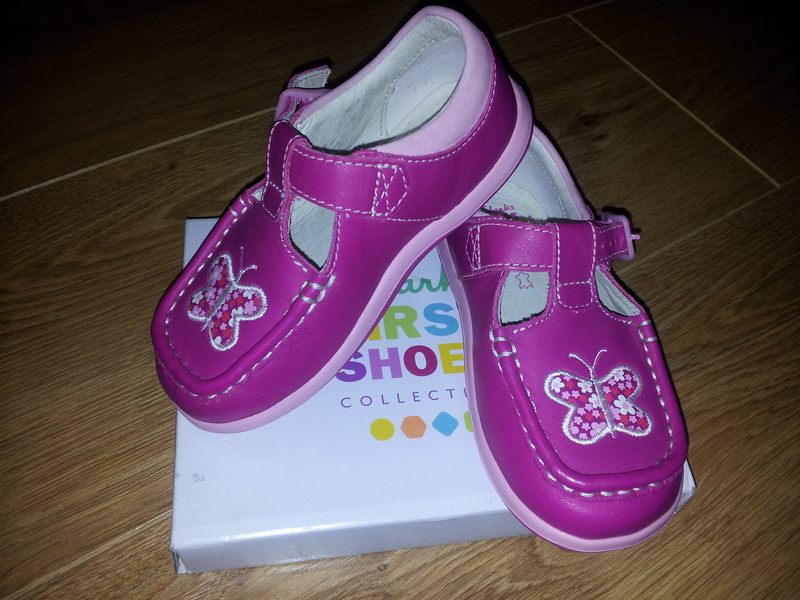 It is wonderful having Lucia finally fitted with her first pair of ‘proper’ shoes and she has been taking the little lid off the box all afternoon just looking at them. And Daryn barely got through the door after work before she was showing them off! Adorable!